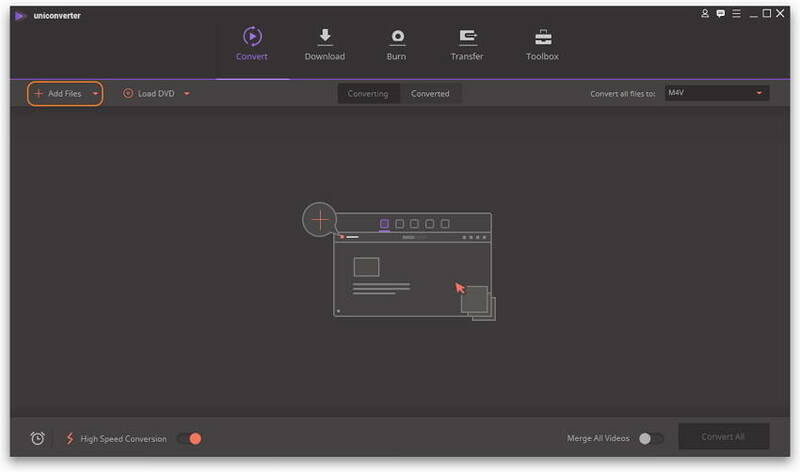 Wondershare M4V Converter is a professional M4V video converter, which not also allows you to convert any video to M4V easily, but also help you convert M4V files to almost all popular video and audio formats like MOV, AVI, WMV, MP4, MKV, 3GP, MP3 etc. What’s more, it's the best iTunes M4V video converter, capable of converting purchased iTunes M4V files for playback on any iPod, iPhone, iPad, Apple TV, PSP, Android phones and more devices. Step 1 Add files to the M4V converter. After launching this M4V video converter, you need to import files you want to convert. To do it, you can go to click Add Files button to browse your computer hard disk to find and load your files, or directly import them by a simple drop-and-drop. This app supports almost all popular video formats. This app contains nearly all popular output formats, such as M4V, MP4, MOV, AVI, WMV, MKV, FLV, SWF, MP3 and so on. According to your requirement, just select M4V or other formats as the output format. If you convert to or from M4V files just for playback on some device, you can also choose a directly-optimized format for the device. To do it, just select one according to your device model. 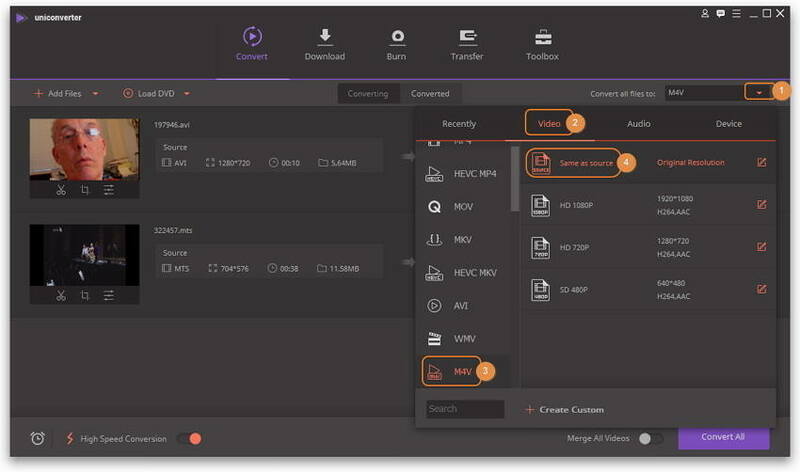 To open the output format list, just click the inverted triangle beside Convert all files to and select Video category, and choose M4V and then the resolution. Step 3 Convert M4V conversion. 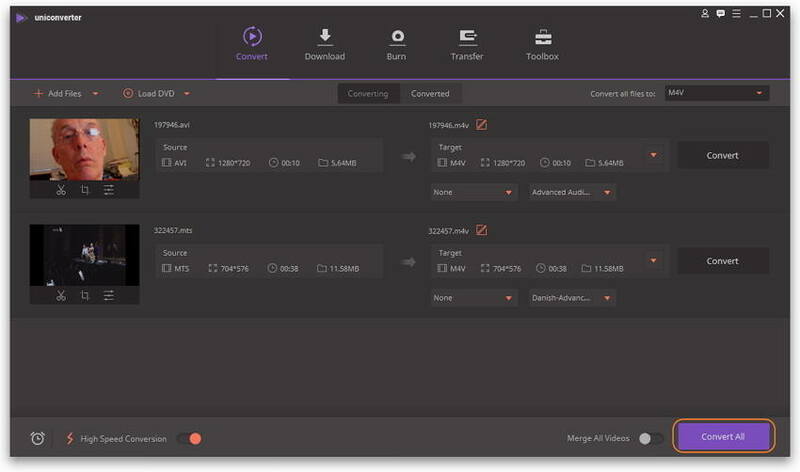 At last, you just need to click the Convert All button to let the M4V converter convert your files to the format you want. After conversion, you can find the converted files according to the Destination path. Convert M4V files to almost any other formats effortlessly. Convert to M4V files from any other videos to play in iTunes, iPhone, iPod, iPad and AppleTV etc. Extract audio from M4V files with the audio quality intact. Support DVD burning and DVD converting like M4V to DVD and DVD to M4V. 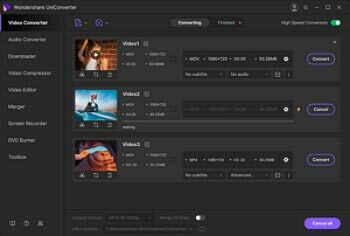 More features like video editing etc.